The Burton Hate is a stable between the feet, fun all around ride for those that live in the Jib Park. If you aren’t a jibber look somewhere else because it doesn’t offer a balanced park ride. 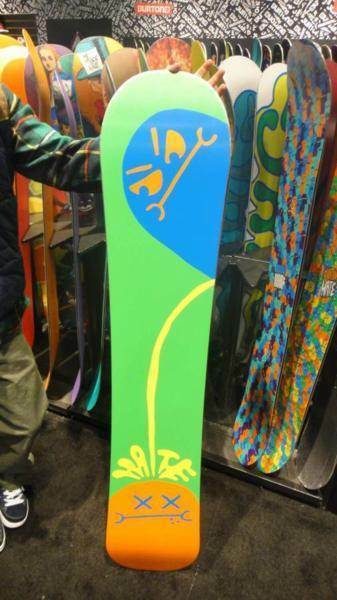 On Snow Feel: Burton’s Flat Top Camber Profile is for sure flat to rocker but it feels a little more like a cross between a continuous rocker and flat to rocker profiles. It’s mostly stable and pretty fun to ride for those that are willing to sacrifice some pop for stability. 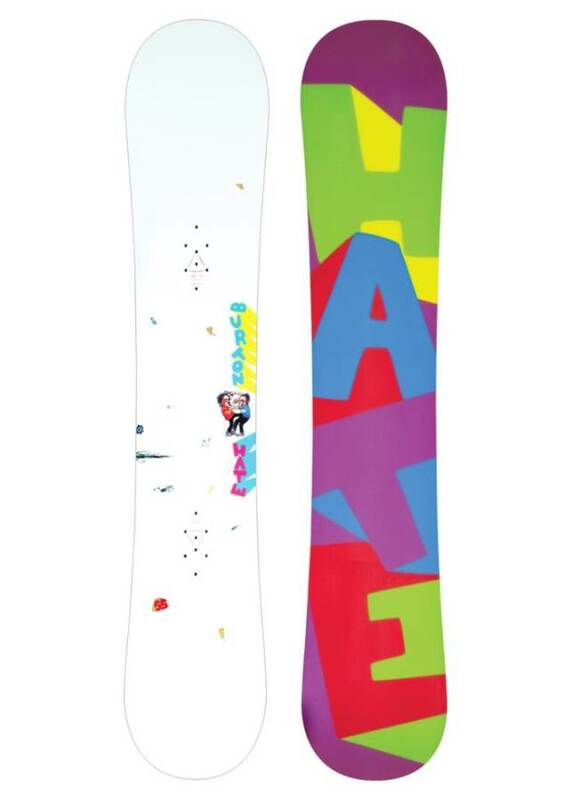 Powder: It’s not bad in powder for a centered stance twin and it will fight to stay up. Turn Initiation and Carving: Noting really going on when it comes to getting some fun out of a turn. 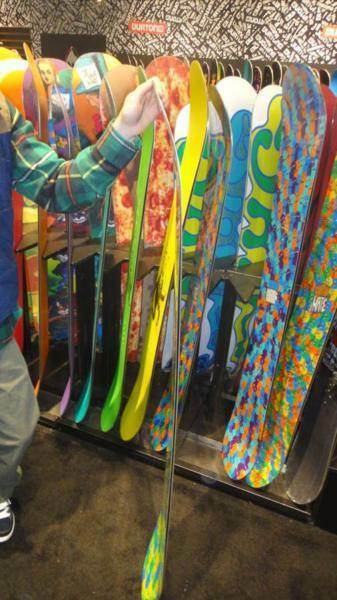 You want to butter and press more than get into technical turning and carving. Speed: Pretty stable at speed and not too chattery but it’s more about park speed than mountain speed. Uneven Terrain: If you leave the park and run into bumpy snow then it’s not bad at all. Edge Hold: Not much edge hold going on despite the frostbite edges that have a 1/2 mm extension at each binding. Flex: Very playful and buttery flex from tip to tail. 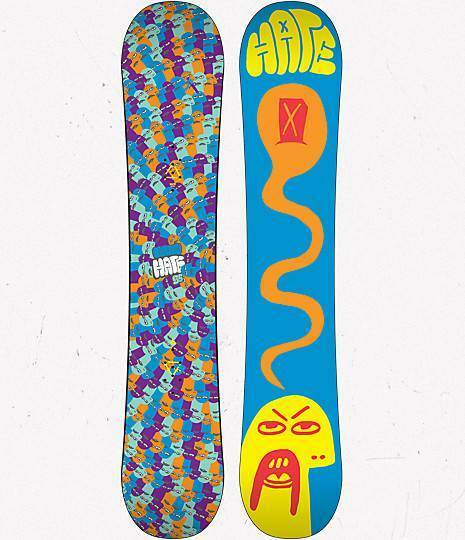 Jibbing: Great jib board and very good hitting technical rails or big scary bonks. The only boards that are better are the Nug style boards. Pipe: Missing the edge hold and carving drive to make it a satisfying pipe board. 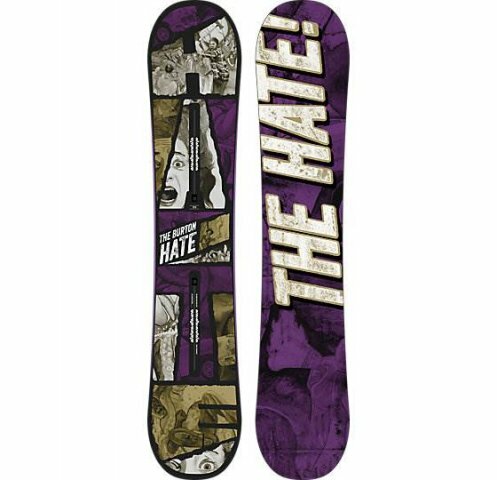 Jumps: The Hate has a little more pop than most flat to rocker boards in Burton’s line and it’s best if you combine it with a Hinge Tech Binding like the Burton Restricted Cartel because it will improve your ollie power. If not you will have middle ground pop. Easy approach to jumps but I’d rather be on a Flying V board instead. 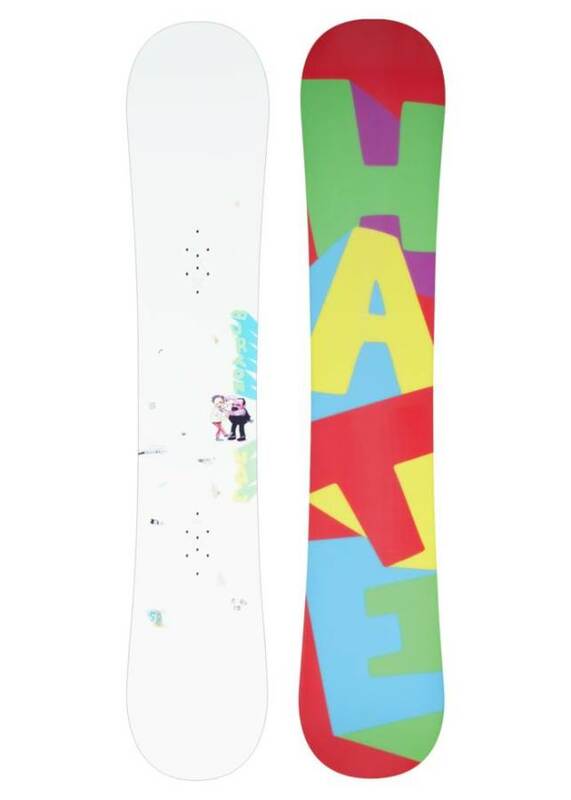 With most boards, we don’t follow the weight recommendations but with the Hate, it will not perform as described if you are heavier than their suggested weight. 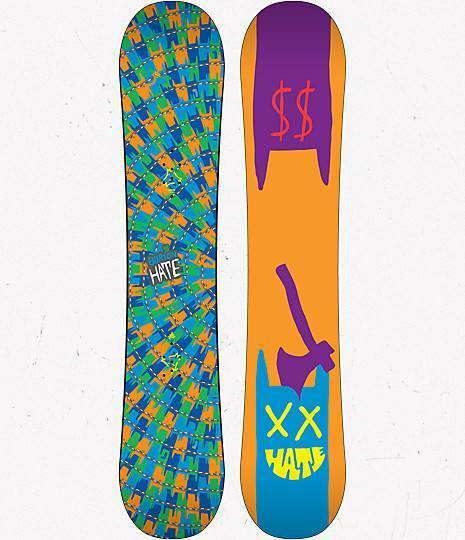 This board is made for lighter riders. 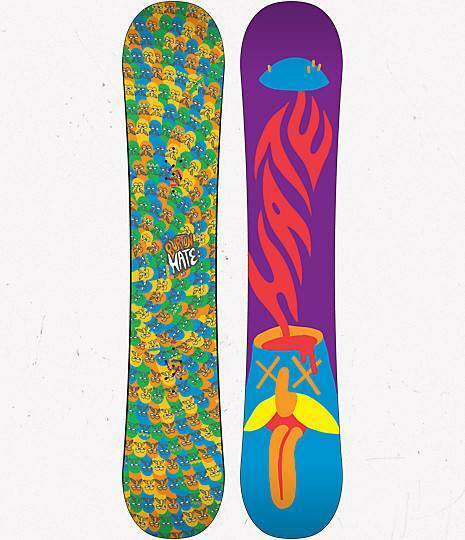 The 2013 Burton Hate uses another tech called flat top which is flat to rocker. The Flat between the feet makes for a more stable ride one footing and hitting jibs. It’s edge hold is slightly improved from 2012 because more board between the feet is exerting pressure but It’s still on the border of average and good. 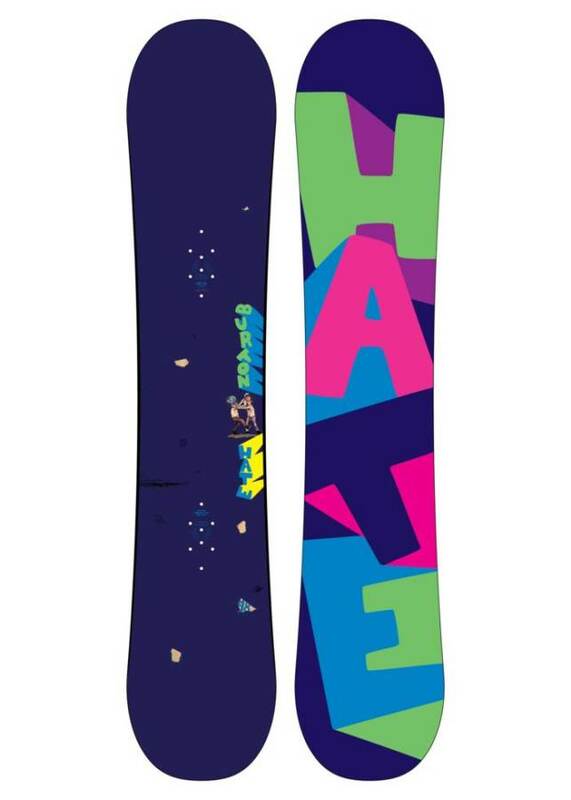 All in all this is a pretty fun ride for those that like the jib park and are on a budget. 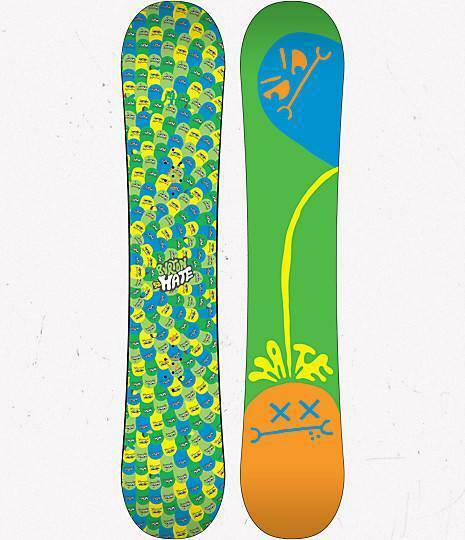 For us the 2013 is the call over the V-Rocker but both V-Rocker and Flat Top provide a pretty good ride. 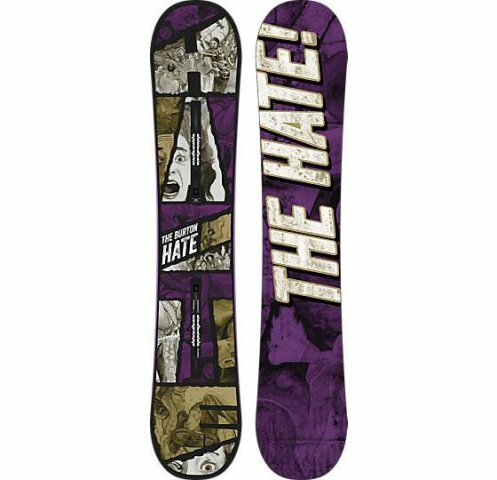 The 2012 Burton Hate has a few refinements but the ride is still pretty similar to the 2011 continuous rocker aka V Rocker Hate. The 2011 Burton Hate it evolved from a flat profile to V-Rocker aka continuous rocker with a flatter profile at the tip and tail. The ride was more fun but lacked edge hold. 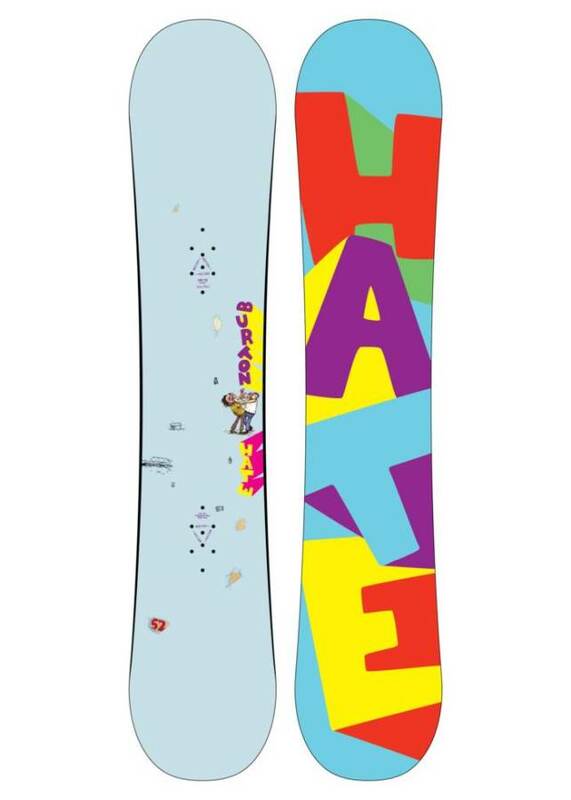 It still rocked the Jib park, added little more fun when it comes to turning and is a little more forgiving than the 2010. 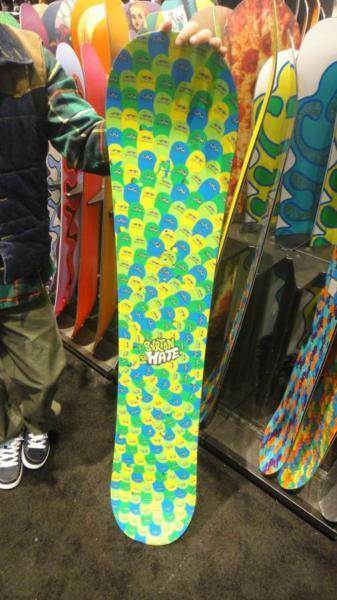 The 2010 Burton Hate started out with Flat Rocker that some liked but most didn’t. It was twitchy and not terribly playful. We try to get as many images of the Burton Hate, but forgive us if they're not all there.